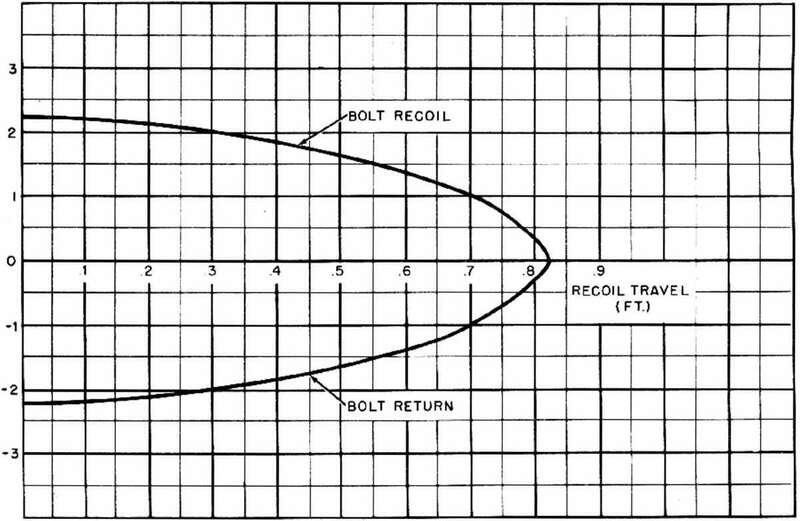 basic bolt and barrel motions and the related forces. No attempt will be made to discuss the straightforward machine design methods by which the results are applied in arriving at the particular physical form of the mcchanisms. Also, no detailed computations are made to cover the cffccts of such factors as friction or the incidental forces imposed on the breech mechanism by the auxiliary mechanisms such as the feeder, firing device, or locking device. These effects will have only a relatively slight influence on the bolt and barrel motions. In any ease, they can be properly taken into account only in the advanced stages of a design when the form of the gun mechanism becomes fairly well established. At this point, the preliminary analysis of the bolt and barrel motion can easily be modified as desired. The analysis which follows is based on the assumption that a particular cartridge with known characteristics is to be used and that the desired muzzle velocity and barrel length have been predetermined. data are known and that graphs showing the time variation of pro jectile velocity and chambcr pressure are available (figs. 2-4, 2-5, and 2-6). determine what distances the parts must travel.